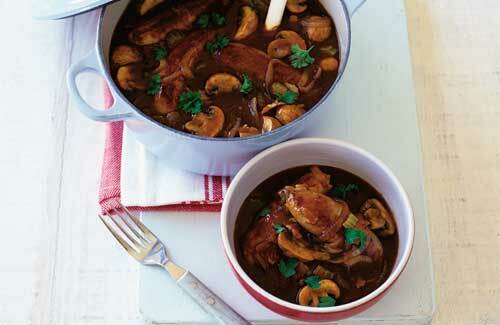 This richly-flavoured, hearty casserole is quintessentially British. It makes a filling meal on a frosty or foggy night. Serves 6. 1. Heat the oil in a heavy casserole over medium heat. Fry the veggie sausages evenly on all sides until brown. Remove and drain on kitchen paper. Alternatively, you can grill the sausages while you are getting on with the rest of the dish. 2. In the same oil, fry the onions, celery and carrots. Cook for around 7 minutes until the vegetables are soft but not browned. 3. Add the flour and tomato puree, and cook for a minute. 4. Pour in the Guinness, bring to the boil, and cook for 2 minutes until the liquid is reduced slightly. 5. Add the stock, and bring back to the boil. Add the cooked sausages, mushrooms, Marmite, thyme and seasoning. 6. Simmer for 15 minutes, stirring occasionally, until the mushrooms are cooked and the sauce has thickened. 7. Garnish with parsley, and serve with mashed potatoes and steamed winter vegetables, such as savoy cabbage, swedes, brussels sprouts, kale or broccoli.